Do you like wearing those sophisticated looking blazers and sport coats that have the contrasting color trim when you're not wearing a suit. Carmashi has introduced an entire new line of velvet jackets that come in many wonderful looking wool plaid patterns this fall. 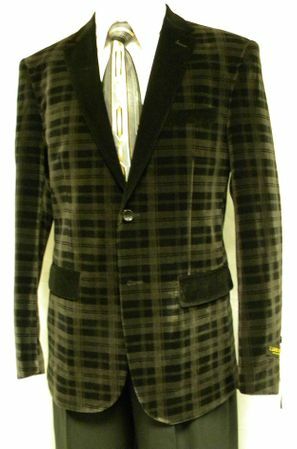 This black with grey color plaid velvet sport coat features a 2 button style single breasted with notched lapels, center vent and plenty of style to dress up or down.